Formal Portraits with wedding party, family and friends, Portraits of Bride and Groom alone. Also includes reception coverage which includes dinner, speeches, cake cutting, bouquet toss, first dances. Includes a 1-1.5 hour Engagement Session before we leave for your destination with 1-8x10 printed enlargement and 15 of your session's images on High Resolution CD. Also includes your choice of 2 hour additional session, either a fun pre wedding shoot on the beach, an amazing trash the dress session after the wedding day or 2 hours coverage of a reception held back home. Price: $1095 plus cost of all inclusive Accommodations for 3 days (2 nights) & air travel from Ottawa, for two photographers. A full weeks accommodation are not required unless you would like more than pre wedding shoot on beach, and day after trash the dress session. Free consultations, we will meet with you and chat. We can answer your questions and help you choose the perfect package to suit your needs and budget. It is important to choose a photographer that you are comfortable with and that is easier to do if we meet! We can also create a custom wedding package to perfectly suit your day. Approximately 1 hour at a location of your choice. On-line PASS gallery for viewing and sharing with family, friends and wedding guest if you wish. Prints may be purchased directly for the on-line album. 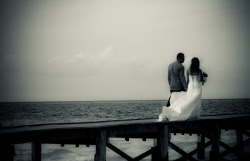 A $200.00 non-refundable reservation fee and a signed wedding contract are required to secure your special day. We are happy to work with you and create a payment plan. Balance must be paid in full 14 day prior to your booking. Package prices are subject to change without notice; however we will honour the original package price offered at the time of your booking if any changes occur after signing. Packages only apply to consecutive hours and must not exceed 11:00pm. If you require time after 11:00pm it is $300/additional hour. Any entry/parking/access fees are the responsibility of the bride and groom. The engagement session is offered as a free gift to give us a chance to work together before your big day it helps couples feel more comfortable in front of the camera it has no cash value is not transferable. ©2008, ©2009, ©2010, ©2011, ©2012. Photographs are property of Special Treasures Photography; Lisa Agnew & Jenn Good. No part of this site may be copied without consent.